Open to your highest wisdom, inspiration and intuition. I experience Spirit Guides as benevolent friends and teachers who exist in a non-physical form. They communicate with me through my thoughts and feelings. These may be backed up by physical signs such as hearing music or words that remind me of them, or seeing a particular colour which reassures me of their presence. I was once explaining Archangel Michael to friend and at that exact moment a lady walked past with a skirt in the same stunning blue colour that I associate with him confirming his presence to me. 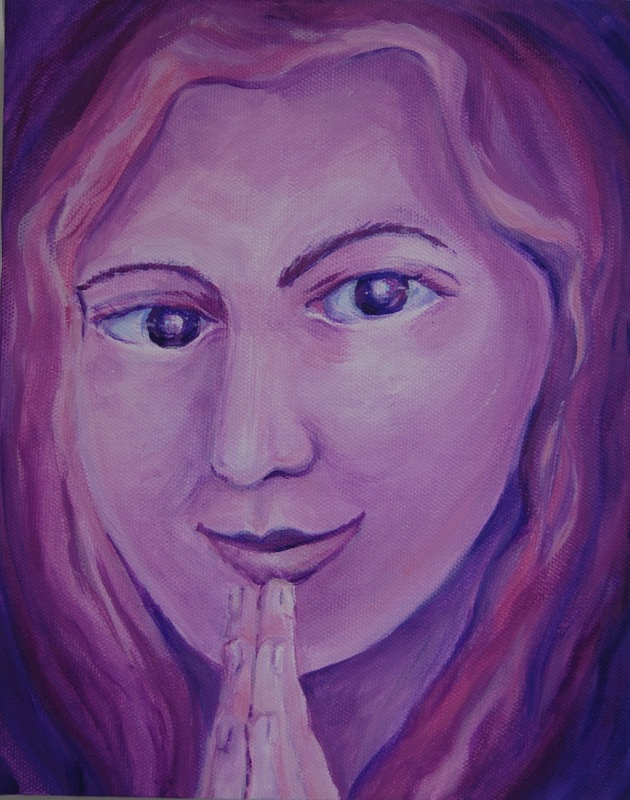 I started painting Spirit Guides after being asked to by clients, and it is fascinating and fun to do. I have frequently wondered what exactly am I painting, and how come this works? I know that I know what to do, and I can feel the connection to what I am asked to relate to the recipient of the painting, but where is this feeling and connection coming from? I conclude that very often the painting illustrates an aspect or part of the persons’ higher self that is most appropriate for them to be in aware of for this particular episode of their life. Images clearly point to talents and abilities to recognise, focus on, and allow into their everyday. This can be reassuring, encouraging and uplifting. In this way your Spirit Guides painting helps you tap into your highest wisdom, guidance and inspiration. We may have several spirit guides through our life. One may stay always with us, whilst others change depending on what challenges we are facing and the kind of support and inspiration that we need. 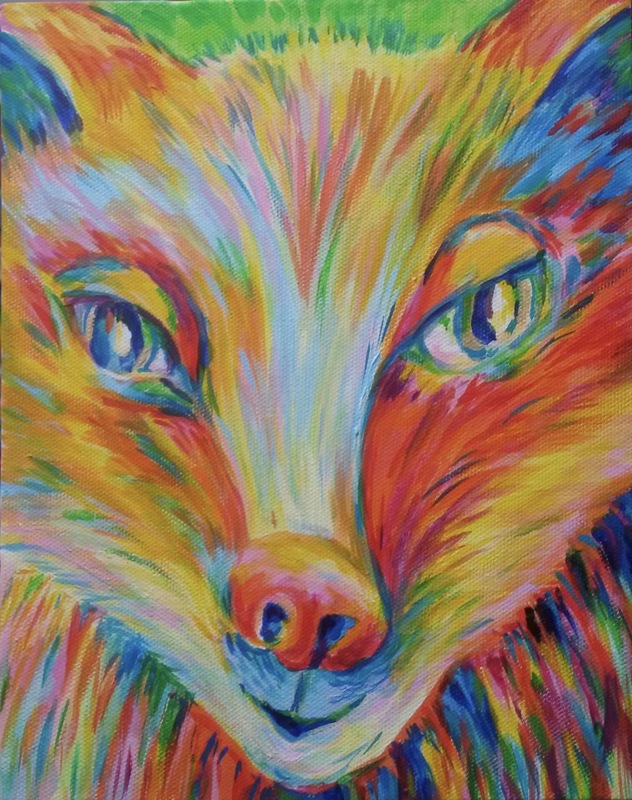 When I paint for you I ask to connect with the Spirit Guide that is most appropriate and beneficial for you to be in contact with right now. I use your name and date of birth to connect to this information. A picture is worth a thousand words and Spirit Guides use their pose and position in the painting, the background, landscape and sometimes props or specific items to make a clear connection to you. I have been called to paint snow and ice, a desert, under the sea, a ploughed field, a jungle, and a cosy fireside. Spirit Guides may choose human or animal form, or a mix of both, or something else. With the unusual images I find that the person whom it is for receives the painting with comprehension. Overall the messages come through with a brilliant sense of humor and the feeling of how hugely we are loved. Spirit Guides are definitely fun, and remind us that we are here to enjoy being who we are. I provide a short reading to accompany the your painting based on what information I receive whilst tuning in to you to paint and what comes up as your painting takes shape. I type it up and post it with your painting. Your painting is best placed where you will see it everyday or can spend some time with it. You could, of course, ask your guide where they would like to be. The canvas is ready to hang on the wall or will stand on a shelf. There is no need to frame it though you can is you wish. I generally use acrylic paints and colours that I mix myself from pigments. Initially, I was slightly disgusted and thrown back by the troll creature. As I started to look at it more and was walked through what it represented, I felt at ease and calm around it. I also like and appreciate the two opposing ideas of the troll and butterfly, and what they represented on a larger whole. I do feel this, there’s lots in the image, and description provided, where I’m in agreement. As I’ve researched and read about things in relation to do with myself, the painting takes on newer and evolved meanings, adding another dimension to its original description. to give an example, I’ve done psychometric tests of vitality and wealth dynamics, and they both put me as an earth element, so to me , a troll creature makes sense, as it ties in with an earthly context. Thanks once again. First of all let me say thank you for my daughters painting, it made me giggle with excitement when I saw it, you really captured her perfectly, it was so amazing and moving all at the same time, she is exactly as you described, and I LOVE her animal guide as you captured him, it really couldn’t have been more perfect..thank you so so much! Thank You for painting my spirit guide. Lina gifted it to me for my 50th Birthday. It as such an amazing thoughtful gesture and I’m forever blessed to have such a soulmate in a friend. I was totally taken aback…such a stunning painting. I felt very peaceful the instant I saw it…it brought a sense of calmness and stillness within me. I simply love the colors and the contours in the face show character. The sparkle in the eyes resonate mine. And, the namaste pose is very befitting. The write-up reflects on my current state of being in this quest to find my own journey. The phrase, “You need to be fearless for this journey and feel safe in the still ness no matter what comes up” is very powerful. It is something I’m really working on and it is an emotional struggle. I also relate to the phrase “shadows and candlelight” I often question my intuition and for most part it has been my savior…I’m learning to trust it more as I get older. Please feel free to use the comment and the photo of my painting. It is too beautiful and mesmerizing for others not to see. Again Thank You Joanne. You’ve truly captured me in so many ways that it’s quite magical.